2018 has been a year of growth as we at Dragon Strand have been hard at work transitioning our chameleon cage building to the next level. My goal is to get the company back to having inventory on the shelf so orders are fulfilled within days of them being placed. Thus we must grow our infrastructure. This isn’t as simple as just adding more people. It does not take much skill to build one cage, but to build cages day in and day out consistently takes much skill and experience. Presently, our biggest challenges are production speed and shipping costs. Shipping costs are negotiated as a result of how much one ships. This is why small businesses are shocked by how much they must pay to use the major reliable services. Just go to Amazon or Walmart websites and everything is free shipping! So our consumer base is used to minor shipping costs. Then they come to a small business and are shocked at what appears to be high shipping costs. Well, FedEX, UPS, and USPS maintain a fleet of airplanes, warehouse hubs, and over 400,000 employees each. If shipping was truly free for the price of Amazon Prime, how would these be maintained? The answer, of course, is that small businesses pay for a disproportionate share of those overhead costs. But my job is not to complain about the system. I am here to work within the system. The more I ship, the lower the shipping price for all products. And I pass the shipping savings directly to the customer. The less I pay the less you pay. My business model does not include bumping shipping up to make a profit there. Each of the Dragon Strand cages are hand made in the US by a small team that has been doing this over a decade. People are surprised when I tell them I do not make these cages myself! These cages are made to my exact specifications by a group of guys who have been making cages long before I conceived of the Dragon Strand company. It was these guys that made the cages for Reptile Depot and LLL Reptile in the 2000s. It was these guys’ cages that were sent back to China to be copied for the cheap ReptiBreeze that is now mass produced. So this is the experience I wanted to leverage for my Dragon Strand cages. They maintain a couple of long term retail accounts, but are now, essentially, manufacturing exclusively for Dragon Strand. As the cheap Chinese imports take over the low end market they needed to transition to the mid-range market which is where many keepers, with a couple years of experience, fall. It takes a little bit of experience to learn what quality features are important! And this is my customer. Thus my team’s experience and attention to detail fits perfectly with the Dragon Strand customer. The chameleon community is growing. Easy access to information via social media is producing an easy step into this fascinating passion. And we must grow as well. Many of you have experienced the inconvenience for having to wait for your Dragon Strand cage. We are actively working to get back to a positive inventory situation where the product is on the shelf ready for the order. This will be a multi-step process as we cannot just add bodies. As anyone who has built a cage knows, although it looks easy, there is definite skill that is required – especially to do multiples. We must change our process to allow us to move from a couple of artisans to managing assembly/production. The trick is that we must maintain the quality we are known for. You all know what happens when you get employees involved. They look for the pay check and lose sight of the core values of the business. So growth must be done carefully. But we have laid out a number of initiatives to streamline our production. Our first initiative has been completed so I will happily share the change in our Dragon Ledges. 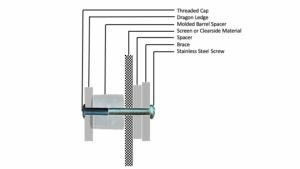 We have transitioned the Dragon Ledge production out of the very manually intensive and chemical dependent glued PVC parts into using molded pieces. Those of you who have ordered Dragon Ledges in the last week or two have seen our new design. Our purpose here was to get the toxic PVC glue fumes and the labor intensive manufacturing out of the production time line. Our patented Dragon Ledges are included in almost every cage we sell (the Nursery and Compact Cage Systems are the only exceptions), so this change increases both the health of the work environment as well as productivity. Although there was no need for more strength in the Ledge part, this design actually gives a stronger aluminum core to the assembly. All in all, it is a significant step forward in our ability to respond more quickly. Although the lead time for the Dragon Ledge sets is usually only a couple days, the sheer number of Dragon Ledges we make for the cage runs means that any savings of time adds up quickly. Of course, saving the brain cells of my cage artisans is the prime benefit. I need these guys! Our next step is the cage construction itself and we have already begun this initiative. I look forward to sharing that success once we have achieved it. Our realistic goal is to achieve the positive inventory situation by the middle of 2019. I want to thank each of you that has believed in the mission of Dragon Strand to give us chameleon keepers and breeders a quality cage. A cage is the foundation to every other part of our husbandry and should not be relegated to finding the cheapest four screen walls possible. We need an option to step up to once we get our wits about us. Not only have you believed in the mission, but you have been exceptionally patient in waiting as we work through our orders and this growth stage. This is why we have a better option in caging. 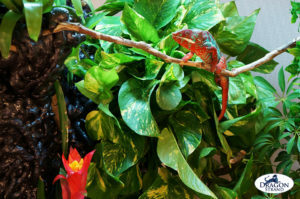 Every year one or two people announce they will start a chameleon caging business, but they are ill prepared for how rough it is to start a business in an environment where you are competing against Chinese imports and Amazon shipping expectations. Dragon Strand remains strong and is growing because of your support. And my commitment to you is that we will continue to push for better and better quality parts and manufacturing. You wouldn’t believe how hard it is to maintain that in this world of seeing how cheap one can make a part before it fails. We are constantly seeking out original US manufacturers and filtering out companies that switch over to cheaper substitutes. We are even now engaging in molding our own parts to ensure quality is maintained and we are not at the mercy of a supplier suddenly switching to cheap imports. I also commit to you that Dragon Strand products will be tested every day in a true chameleon keeping and breeding operation. I will constantly refine them to bring you the best commercially available products. I have teamed up with skilled caging engineers. My job in all of this is to constantly explore better ways we can keep chameleons in our home. Their job is to make it reality. And I assure you, we are constantly moving forward. You can expect more news in the coming months!